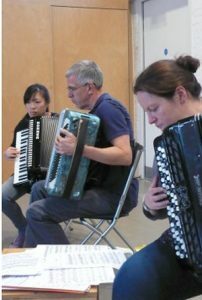 We welcome new members and recommend you have achieved a certain level of playing when joining Morley Accordion Club. Although our members come from differing backgrounds and have a variety of experience, this is all skilfully accommodated in the tutorials by Julie North. Firstly you need to able to read music in both treble and bass clef and have a basic understanding of scales in major and minor keys. You also should be able to play a scale of C major in the left hand on a standard stradella bass. It is recommended that you have a minimum of 72 buttons or more in the bass to get the most out of your instrument. Players with instruments that have free bass are also encouraged to join us. The sessions provide opportunities to improve your technique, to experience playing within a duet, trio or ensemble. Participants are also encouraged to introduce their own choice of music or new music, to write arrangements or bring along their own compositions. The fee for the academic year is £144 (9 sessions at £16 each) or £21 for an individual session as there is no annual commitment. You may try out two sessions at £21 each and if you wish to commit to the year, you need then only pay the balance.